Cafeteria in Back Bay serves it up right! I’m baaack!!! And with a vengeance… I think I have finally shaken off my lame-o, non-posting, rut and have gotten back on track — starting with date night this past Friday night. 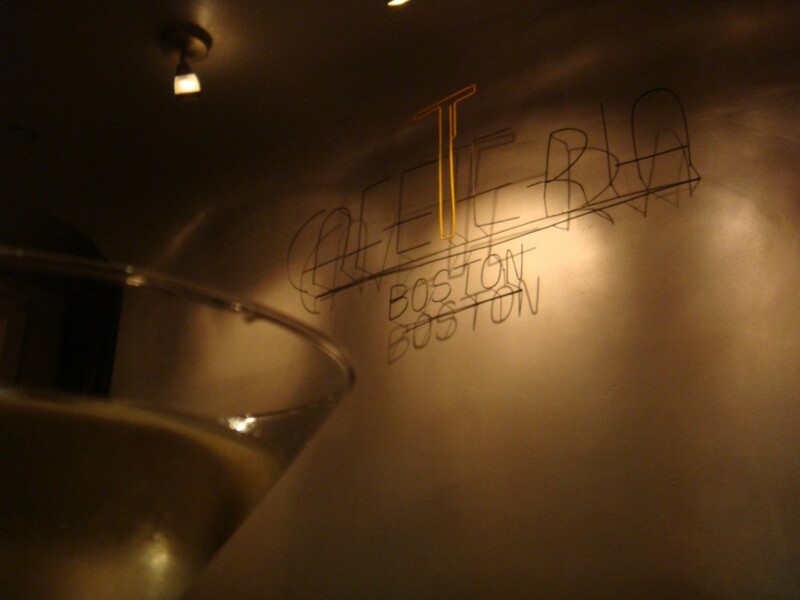 We hit up Cafeteria in Back Bay for a few cocktails and dinner. I had bumped into the owner of Cafeteria a LONG time ago in Starbucks in West Roxbury. Being the nosey person that I am — when I overheard him talking about “his” restaurant — of course I had to introduce myself. I’ve been wanting to try out the place since then (especially because it seems to be a popular joint for the Hollywood set when they are in town)… but never got around to it until now… and what a pleasant surprise! They had just switched their menu over the week we went… so we opted for some seasonal drinks to get us started. 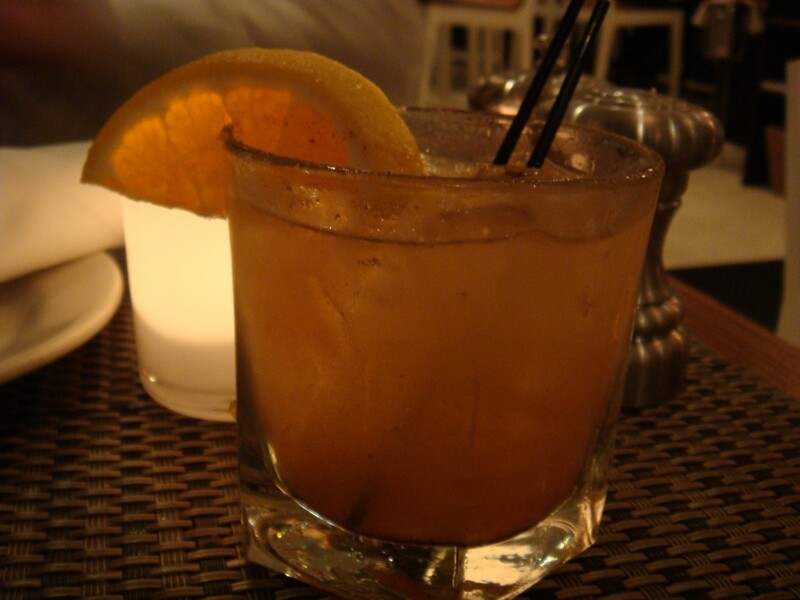 I had the Spiced Bourbon — bourbon seasoned with cinnamon, nutmeg and fresh citrus juice ($11). I don’t love bourbon, but I wanted something “seasonal”… so this seemed like a good fit. It was poured with a heavy hand and had a great warming effect from the spices. I had two of them. They were good. I was buzzed. 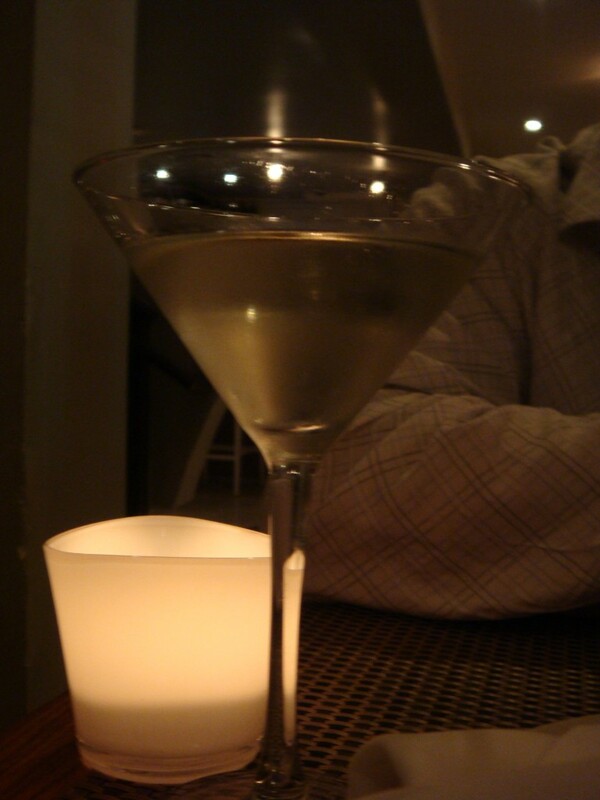 The Husband went with the Gloucester Street (which they are on the corner of), which was a combination of gin, St. Germaine and Sauvignon Blanc ($12). It was fresh, fruity and crisp… without being too sweet or too strong. A really nice drink. 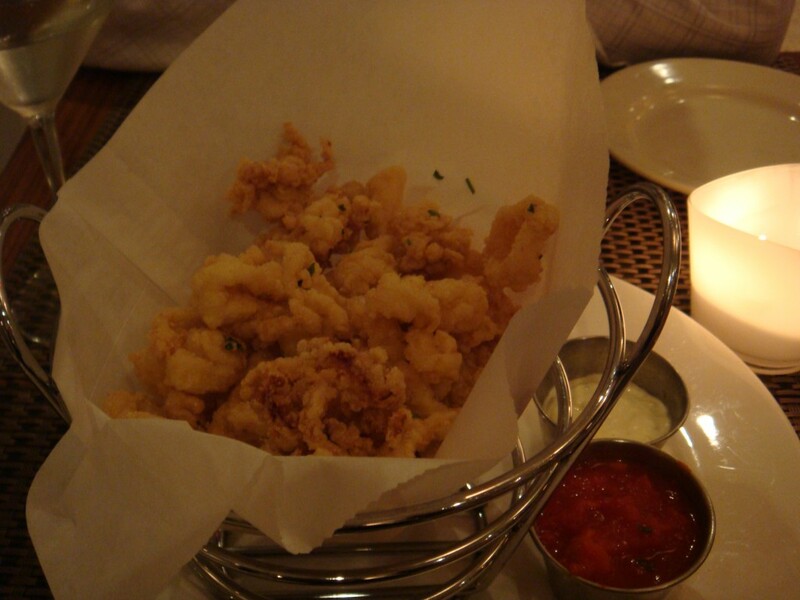 For apps, we started with the Fried Calamari — served with marinara sauce and a lemon aioli ($9.5). The calamari was perfectly fried, tender and a bit salty (which I love). We were essentially fighting over the bits and pieces left at the bottom of the cone… it was THAT good. Their entire menu is very “comfort food” focused right now… and I’m not a really comfort food person. I don’t eat red meat, I’m not a big fan of mac ‘n cheese and I can take or leave other “feel good foods” as well. So I had a difficult time choosing what I wanted. So, against my norm… I opted for something I would have NEVER expected myself to get. 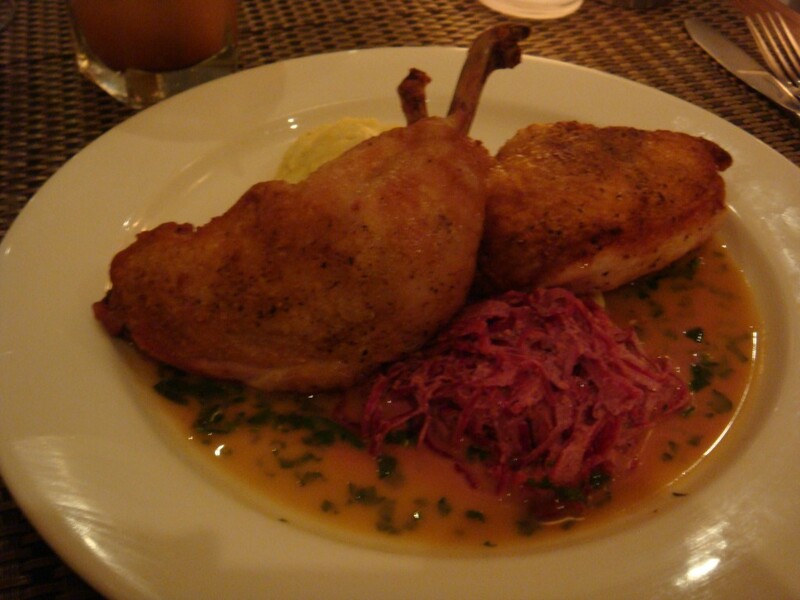 The Roasted, Organic, Spring Chicken— served with mashed potatoes, an au jus and a horseradish/cabbage slaw ($22). So why was this something I would not have normally ordered? Well, if you know me… I RARELY and I mean rarely ever order chicken in a restaurant. And, I can honestly say that I have NEVER ordered chicken served on the bone — EVER — in a restaurant. Really. NEVER. So this was a huge step outside my comfort zone for me. IT WAS AMAZING. I even ate every single ounce of skin that bird was covered in. I haven’t eaten chicken skin in years and years. It was so fricken delcious, I haven’t stopped thinking about it since. I didn’t want to (because I’m selfish), but I even let the Husband taste it and he agreed. Delicious. The mashed potatoes and au jus were incredible too and the horseradish slaw completed the meal with a nice Fall punch of flavor. 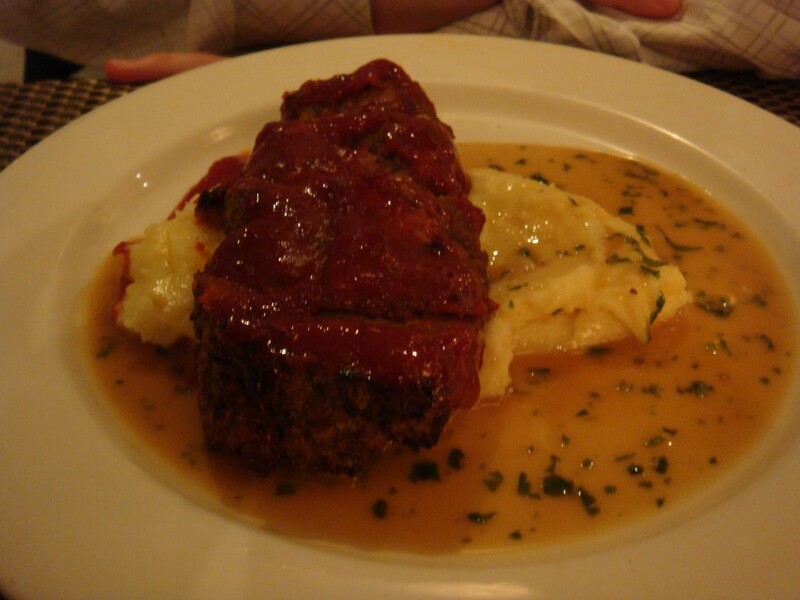 The Husband on the other hand, LOVES comfort food… so he went with the Meatloaf — covered in a spicy ketchup, served on top of mashed potatoes and served with the same gravy as my dish ($16). The verdict? He did everything except lick his plate clean to scarf up every last bit of food. He wanted me to taste it too… but I had to draw the line somewhere. We would have ordered coffee and dessert, but we were both too full from totally housing the dinners. For a place that calls itself “Cafeteria” and serves up comfort food at a reasonable price, the abience was cool, chic and trendy. We were definitely impressed. Overall, the service was decent — our server was sort of a cross between a surfer dude and college jock — so he wasn’t the most articulate, but our food came out fast and he was very attentive. They also serve paninis and pizza, so you can easily have dinner there for a pretty cheap price. We’ll definitely be going back.